Yummy, Low Calorie Diet Food -- Plus Where to Buy! : Low Calorie Lunch With English Muffins! Low Calorie Lunch With English Muffins! I always loved English muffins as a kid, but I've steered clear of them through many years of dieting and watching my weight, because I always assumed they were high calorie like other white colored breads that I knew I needed to avoid. But, I recently rediscovered them (ironically they were in my refrigerator because someone I live with eats them a lot), when I happened to see the nutritional information on the back of the box. 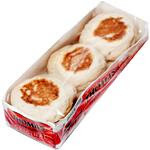 Now, maybe you all already knew this, but English Muffins are totally within reason calorie-wise and if you choose carefully, you can even eat ones that are actually pretty good for your health and your diet. So, first off - the calorie information (skip this section if you already know). Having done a little research, I've found that English Muffins generally range from 1-3 WW points (100-180 calories) depending on the brand. My English Muffin of choice is the Thomas Original Version which is 120 calories, 1 gram of fat, and 1 gram of fiber -- coming out to 2 weight watchers points. Thomas makes some other "lighter" multi-grain and 100 calorie versions of their muffins which you can find for 100 calories or 1 WW points (amazing, huh? ), but you need to watch out for High Fructose Corn Syrup (which I passionately avoid). Whole Foods also makes a really yummy English Muffin, which my husband likes to buy, which is 3 WW points (140 calories). Lastly, I found a 7 sprouted, super-thick, flourless English muffin (with honey) made by Azure Standard at Whole Foods that was also 3 WW points. So, there are definitely plenty of options and choices depending on your preferences. English muffins actually make a delicious bread substitution for any diet, and are great to eat as part of any low calorie breakfast, low calorie lunch (or even snack). - Classic Low Calorie Pizza: Cover each side of the English muffin with pizza sauce, low calorie mozzarella or other low fat cheese, and optionally add low calorie pepperoni and then cook in your oven or microwave. - Olive Oil: Drizzle a tablespoon of healthy olive oil across the muffins for a really yummy low calorie breakfast or low calorie snack. - Low Calorie Cheese Sandwich: Put a slice of fat free or low calorie cheese inside of your muffin to create a delicious and low calorie cheese sandwich. - With Low Calorie Cream Cheese: Spread your favorite low calorie or fat free cream cheese (mine is Philadelphia) on your English muffin instead of on a high calorie bagel. - With Hummus: Spread your favorite low calorie hummus across your English muffin for a high protein low calorie snack. - Vegetarian Burger or Chicken Patty Sandwich: Use an English muffin as a bun to go with your favorite veggie burger (mine coming soon! ), chicken breast, or boca spicy chicken patty, or deli meat. Add the appropriate condiments (like mustard, bbq sauce, spinach, lettuce, etc.). Eat with a fruit salad or some low calorie baked krisps to make a great low calorie lunch. - Eggs: Whip up some egg whites or some egg beaters (both extremely low in calorie and high in protein) and make an English muffin egg sandwich for a really yummy low calorie breakfast! I'd love to hear your ideas as well so please feel free to add them to the comments! The Thomas Hearty Grains 110 calorie english muffin is now made without high fructose corn syrup. That's great news. Thanks for letting me know! I will check them out next time I go to the grocery store. Oroweat makes a whole wheat double fiber english muffin that is fabulous. No partially hydrogenated anything or HFCS, 8 grams of fiber each and 110 calories. Fabulous!! I picked up the Whole Wheat Thomas English muffin thanks to you this weekend. I saw them on sale for $2.00 at Pavillions. I saw the lighter version you were talking about, but it wasn't whole wheat. 120 calories isn't too bad.